The market for talent has seen massive fluctuations over the last eight years. The 2008-9 global recession caused massive employment contractions across all major regions, however, the tide has really turned to turn after one of the longest sustained periods of economic growth in the last 200 years, with the need for fresh talent is on the rise. Coupled with the rise of the intelligent digital business, these dynamics have forever changed the way organizations have to approach their HR function as seek new expertise and mindsets. As such, optimization and smart thinking across the entire HR stack is a critical requirement to attract, onboard and nurture talent within organizations. As more and more millennials enter the workplace (now making up a third or staff), employee interaction has to change. The always-on, always-connected workforce is here. Organizations need to adapt HR functions accordingly and embrace mobile and cloud technology that can be accessed anyway and anytime. Cloud HCM platforms have developed user interfaces that speak to this new workforce, but with ~50% of buyer organizations still using on premise legacy HCM systems, there is still a long way to go for many organizations. By partnering with proven service providers, organizations can now make the migration to the cloud quickly and efficiently. Also by leveraging the managed service expertise of these providers, organizations are more enabled to focus on key moments of truth with employees thereby reducing employee churn and having a more aligned, motivated and focused workforce. Knowing the importance of these solutions for the very future of HR, we put our best and brightest on this. 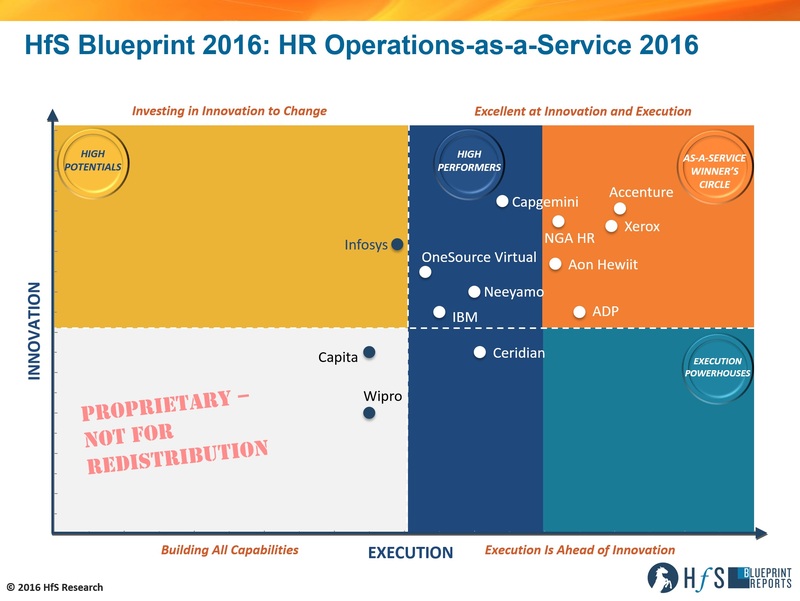 And the result is HfS Human Resource Services Research Director Mike Cook's first Blueprint for HfS: HfS Blueprint: HR Operations As-a-Service 2016. So we invited him in to tell us all about it. How did this Blueprint take shape, Mike? In this HR Operations HfS Blueprint, we take a look at the evolution of MPHRO to “As-A-Service”--a services market that is increasingly agile, collaborative and employee-centric. HfS considers this transition in outsourcing a move to the As-a-Service Economy, placing increasing value on diverse talent, analytics, and collaboration, as well as increasingly on platform-based services. To develop this Blueprint, we spoke to service buyers and service providers to understand the innovation and execution capabilities of thirteen multi-national, multi-functional service providers with MPHRO business process support capability in their portfolio: Accenture, ADP, Aon Hewitt, Capgemini, Capita, Ceridian, IBM, Infosys, Neeyamo, NGA HR, OneSource Virtual, Xerox and Wipro. Accenture has proven to be extremely forward thinking and innovative in the way it brings MHRO services to market. The service provider has made extensive use of automation, integrated services and technology across its MPHRO stack. The development of HR apps that address multiple HR touch points across the employee lifecycle are a differentiator for the service provider. Accenture also has the “critical mass” to deliver on large multi-country, multi-language deals. Xerox has focused its MPHRO practice on operational and customer experience excellence. The service provider has received high praise from clients for its on-demand and proactive account management. Xerox leverages it in-house HCM consulting capability, partnerships with “best of breed” HCM implementation organizations and proprietary HR technologies including, [email protected] and DiscoTM, to overcome client’s legacy technology. NGA HR has proven tactically excellent on delivering the minutiae of contracts. The service provider has made extensive investments in making ResourceLink a plug and play platform as well extending its SuccessFactors, Workday and Oracle HCM implementation capabilities. NGA is also aiming to further evolve into an As-A-Service provider through its ongoing development of automation initiatives. Aon Hewitt is a well-established and reliable MPHRO service provider. Clients have praised Aon Hewitt’s account management team for its proactive nature and the wider organization for its adaptive and collaborative business model. The service provider has a well-established Workday implementation practice in addition to the development of in-house tools including Total Benefits Administration (TBA) and UPoint. ADP is the largest global provider of payroll services. The service provider has embraced the As-A-Service ideal of Design Thinking through the launch of its two innovation labs. Through the employee first focus of these labs ADP has launched its ADP Mobile Solutions application, aimed at improving employee experience and reducing frustration. Capgemini is establishing itself as an up and coming service provider and is a one of the market leaders in delivering on innovation initiatives in the MPHRO market. The organization is implementing elements of plug and play digital business services, analytics and automation within its MPHRO stack. Capgemini now needs to fully develop its RPO offering to transition into the Winners Circle. The extensive internal changes at IBM have renewed the company’s focus on HR. The service provider is an implementation partner for all the tier-1 HCM platforms and is leveraging its Watson platform to enhance analytics and cognitive automation across client’s operations. IBM does have gaps in its MPHRO portfolio, specifically benefits admin and workforce development services, which it will need to address to enhance its position in this market. OneSource Virtual (OSV) has a strong As-A-Service mentality in its DNA and has polarized itself through its sole Workday services practice. The service provider has received praise from its client base for its responsiveness to client demands and the way it adapts to new business challenges. OSV has made extensive use of automation in its MPHRO practice through its proprietary Atmosphere Workday automation platform. Ceridian, a previous heavy hitter in this industry, appears to be moving its focus away from MPHRO service delivery and instead focusing on its proprietary Dayforce sales and implementation practice. The service provider has developed a well-established analytics component into its service delivery. However, feedback from clients has been sub-par on the organizations recent performance. Infosys is aiming to become an MPHRO service provider of choice. The company has made extensive investments in automation and next level analytics, through feedback received from clients. At present, however, Infosys has been lacking in effectively communicating and implementing these As-A-Service ideals to its client base. What do we see changing in the future? In general, HfS believes that the MPHRO market is fragmenting, especially in the Western world, as buyers of services look to implement specific transformational point solutions from service providers as opposed to the previous practice of acquiring end-to-end solutions. This is not to say the MPHRO market is contracting, HfS forecasts the market to grow at 4.5% through to 2017, although it is at a slower rate than the overall HRO market which is currently growing at 6.5% through to 2017. HfS is also of the opinion that buyers are increasingly seeking support in HR transformation from their service providers. Therefore, service providers, such as Accenture and Xerox, which have a robust consulting practice, are leading the way in this market. The development of cloud HCM platforms has lowered the entry point to new entrants in the MPHRO market (for example OSV) which has taken advantage of tailoring processes specific to one platform. 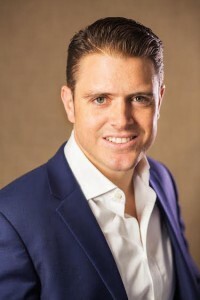 However, in order for these new entrants to be successful, an in-house, or bought in, application development practice is still needed to deliver on client’s expectations across automation and analytics delivery as the majority of cloud HCM platforms available are still not up to the job. And what do you see along the road, for MPHRO, Mike? Recruitment: This is increasingly becoming an area of focus for MPHRO service providers as there is significant opportunity in the market for process improvements, specifically around the onboarding function. Losing candidates at this stage of the hiring process is both costly and frustrating, although minimal focus has traditionally been aimed at this crucial juncture. The likes of Accenture, Xerox and IBM have all developed services around onboarding which have reduced attrition from successful candidates in client’s organizations. Analytics: While all service providers have, or are in the process of, developing analytics offerings in support of HR functions, the majority of clients interviewed in this Blueprint still require greater workforce and HR insight. A key point raised by buyers has been the need to link HR data to business outcomes. At present few service providers, with Infosys, Accenture and Capgemini been exceptions, are delivering this next level insight. Automation: The HRO market has been slow to embrace wide scale automation within service delivery. At present most of the automation available is for simple transactional processes such email actioning. More intelligent automation such as workflow routing and prescriptive HR management functions are beginning to come to market and are in the development or pilot stage with numerous service providers including: OSV, Neeyamo, Infosys, Capgemini, NGA, Aon Hewitt, Xerox and Accenture. As more than one service buyer pointed out, innovation is often kept back by their own internal resistance to change. The development of innovative HR solutions is fully underway within all leading service providers, although challenges are arising in MPHRO deals in which there are often numerous stakeholders, and therefore opinions, on the buyer side (HR department heads, etc.) and large organizations that are holding onto legacy platforms and processes. The way forward in this market needs to start at the negotiation phase of the contract, whereby both c-level and departmental execs are included to act as sponsors for change within the HR function and contracts are priced in a way that promotes constant innovation from service providers. Pricing models that have proven most effective include an element of per employee/transaction in addition to outcomes pricing, FTE pricing is dead in the MPHRO As-A-Service environment! Furthermore, there needs to be more collaborative engagement and ongoing industry discussion with clients, in ongoing contracts. The only way for the As-A-Service environment to really take hold in this industry is for organizations to interact in meaningful dialogue with both peer organizations and service providers.